Fat puppies and chubby babies are probably the best. There's so much cuteness in this photo. 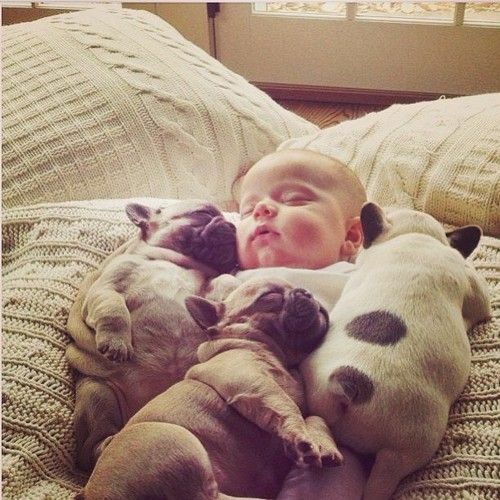 I don't know how this baby is sleeping with all the puppies on him! I've been having some crazy pregnancy dreams lately. Last night, Bill and I ate late and went to bed soon after. I had the weirdest dreams and so did Bill! I had this dream before being pregnant, but it was more intense this time. I got super nervous because it was the middle of the semester in college, and I just remembered that I had forgotten about my math class. I just stopped going to it after a few classes, and then mid terms came and went and I remembered I had a math class! It was basically my worst nightmare to have a math class. I woke up from that dream and realized that I'm not in college and my jobs have nothing to do with math! Woohoo!! I hate anything to do with math if you can't tell. This is by far the weirdest dream I've had. My mom, Bill, my brother Phil, and my sister Megan and I were driving together. Phil started talking about how he was going on a trip, and he was going to bring Megan. I was jealous that he was only bringing Megan. I kept asking him where he was going, and he finally told me that he was going to Iraq. I was so upset that I wasn't going with them to Iraq that I jumped out of the moving car and walked away. LOL I still have no idea why Phil was going to Iraq or why I wanted to go with him!! There's been more dreams, but I can't remember them at the moment. I think I'll keep on documenting them this way when I have some more odd ones. Anyone else experience crazy dreams while pregnant?